All year-round beautiful weather is the best part of living in Southern California. A deck can add extra living space to your home. Wood or composite material can be used to make a property’s unusable areas into enjoyable outdoor living spaces. 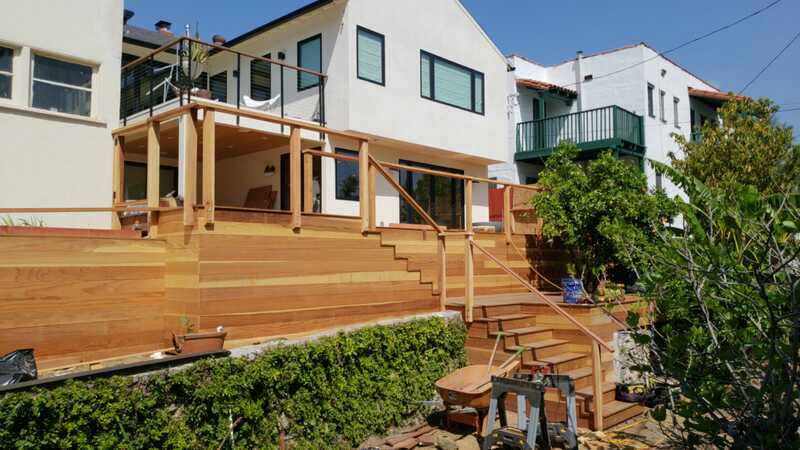 In Los Angeles adding a deck is like adding a room, only less costly. A room without walls. The sky for a ceiling. Large or small decks are expansions of floor space. Custom built to a property’s architecture and terrain, MG Construction’s decks take advantage of a home’s unique character. By adding a deck to your home your backyard can turn into an oasis. In densely developed areas, we can preserve privacy with custom railings and fencing. Building with a variety of decking materials enables us to tailor projects to most budgets and styles. We use a variety of woods and composite materials to match our designs to the needs of the customer. MG Construction & Decks can add custom built-ins such as bench seating, hot tubs, spas, firepits, patio covers and outdoor kitchens. The sky’s the limit. Michael Gabso, the designer, builder and President of MG Construction & Decks, will design and build a custom deck that fits your home as if they were created together. With Michael’s passion for outdoor design and renovation he, along with our expert project managers, will create an entire new living space. Michael Gabso uses 3-D modeling software to develop a design with which the client is happy. Together our in-house deck building crew with over 100 years of experience turn Michael’s designs into a unique creation. MG Construction & Decks knows the process to obtain the required permits if necessary. However, not all decks require pre-approval. Our MG Construction & Decks experts know what you need.